I hardly ever peel a potato these days: first, I can't be bothered. Second, all the finest flavour of a potato lives in its skin, and just underneath it. There are, admittedly, a few dishes that need potatoes to be peeled - good, fluffy, buttery mash and rustling, crunchy roast potatoes are great examples - but I reckon that standing over a sink flaying the skins of potatoes for a stew or slow-cooked casserole is just madness, and a waste of time. But a potato soup is a different matter. I wanted a good, earthy taste to this soup, but I didn't want leathery flecks of potato skin to ruin the texture. The solution was to use some beautiful new potatoes - bought from my local supermarket - which had thin, delicate skins that would disintegrate easily into the blitzed-up soup. This soup tastes like liquid Pommes Dauphinoise: creamy and soft, with hints of nutmeg and butter. It's easy and quick to make, but take care not to over-process the soup when you liquidize it, or it may become gluey. A rich home-made chicken-stock is essential: a supermarket stock cube or stock powder will not do. You can make a good stock quite easily from an inexpensive pack of chicken wings and a few vegetables and herbs (here are my tips for making a quick stock; scroll to the end of the post for the recipe). If you can afford it, do buy a few slices of genuine Parma ham for the top of this soup, from your local deli. It's wildly expensive, I know, but you'll only need six slices, which won't amount to much in cash. 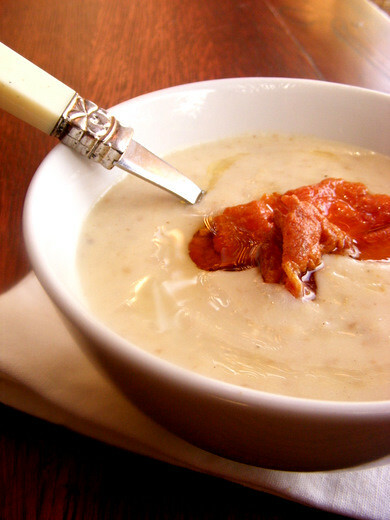 If you can't find Parma ham, fry a couple of slices of streaky bacon until they are very crisp, and crumble them over the soup. Heat the olive oil and butter in a big pot over a moderate flame. Add the chopped onions, bay leaves and salt, and fry gently for six or seven minutes, or until the onions are softened and translucent, but not browned. In the meantime, finely slice the new potatoes, skins and all. Add them to the pot, turn up the heat a little, and cook for three minutes, turning frequently. Now pour in just enough chicken stock to cover the potatoes. Simmer, uncovered, for 30 minutes - top up with a little more stock, if necessary - or until the potatoes are completely tender. Add the milk and nutmeg, and simmer for five more minutes. Transfer the mixture to the jug of a liquidizer (or use a stick blender) and blitz until smooth. If the soup is too thick for the blades to turn freely - this will depend on the potatoes you used - add more hot stock, milk or water to thin it down. Do not over-process, or the texture will be ruined. Return the soup to the pot, stir in the cream, season with white pepper and salt, to taste, and gently reheat. Heat the oil in a frying pan, over a high flame. When the oil is very hot, carefully drape the Parma ham slices over the base of the frying pan. Let them sizzle for 45 seconds, then turn them over. When the ham begins to shrivel and crisp, remove it from the pan and drain on kitchen paper for a few minutes. Swirl the olive oil over the top of the soup, top with the frizzled ham, and serve piping hot. Oi, that soup is so thick an d creamy! The soup itself is so dirt cheap that you can spoil yourself with some parma!!! Oooh yes please. With you on the potato skins issue - life's too short to peel away the good stuff. Although, if I do find myself peeling, crisping the peels in the oven is a highly recommended use of what otherwise would be thrown in the bin. Oh YUM. That sounds gorgeous - I'm not really one for homogenised soups, but I think a new potato soup might do the trick. And ANYTHING with crispy Parma ham gets my vote. Sounds delicious! Potatoes AND soup? What a combo! I've also been looking everywhere for an easy chicken stock recipe - thanks! Your foodie photos are beautiful, by the way. Thank you Bridget. Very much appreciated.